The PSC Falcon 315 has been discontinued. No direct replacement is available. The Falcon 315 offers a choice of 2.4 GHz spread spectrum radio solutions, providing long range mobility, high throughput, advanced power management and seamless roaming among multiple cells. 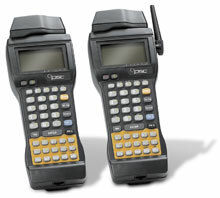 The Falcon 315 portable data terminals are an excellent choice for fast and accurate data collection applications. Durable, ergonomically designed and flexible, these units have many features you would expect to find in a more expensive product. Featuring open architecture for ease of application development, the Falcon 315 line runs DOS 6.22 on a powerful 32 bit, 386-based platform. It includes an 8x21 backlit graphics display, a 41 key keypad, an RS-232 serial port, 2MB of RAM, 2MB of flash memory and a choice of standard-range or long-range integrated laser scanners. Entry Level Solutions for Portable Data Collection The Falcon 315 are an excellent choice for fast and accurate data collection applications. Durable, ergonomically designed and flexible, these units have many features you would expect to find in a more expensive product. Featuring open architecture for ease of application development, the Falcon 315 line runs DOS 6.22 on a powerful 32 bit, 386-based platform. Both units include an 8x21 backlit graphics display, a 41-key keypad, an RS232 serial port, 2MB of RAM, 2MB of flash memory and a choice of standard-range or long-range integrated laser scanners. The Falcon 310 has a user-accessible PC Card slot for extra memory, network connectivity or a modem card. While the Falcon 310 provides batch data collection solutions, the Falcon 315 offers a choice of 2.4 GHz spread spectrum radio solutions, providing long range mobility, high throughput, advanced power management and seamless roaming among multiple cells. The Falcon 315 also offers extensive network connectivity protocols, allowing you to easily integrate this comprehensive RF data collection solution into your existing operation. The Falcon 315 line includes a set of powerful software tools that make it easy to create data collection and management applications to fit your needs. Uses include inventory control, shipping and receiving, factory floor data collection and warehousing, in a variety of industries including health care, retail, manufacturing and transportation. An exceptional value, the Falcon 315 line brings cost-effective efficiency to your operation.